This statistic displays the non-Western population of the Netherlands in 2018, by background. Of the total non-Western population of approximately 2.3 million people, people of Turkish origins formed the largest group with approximately 404,000 people. The Dutch of Moroccan and Surinamese descent form the second and third-largest groups, with approximately 397,000 and 352,000 people respectively. According to a recent forecast, the population with a Turkish or Moroccan background is likely to increase further in the future, whereas the population with a Surinamese background is expected to decrease, as is the population with an Indonesian ancestry. 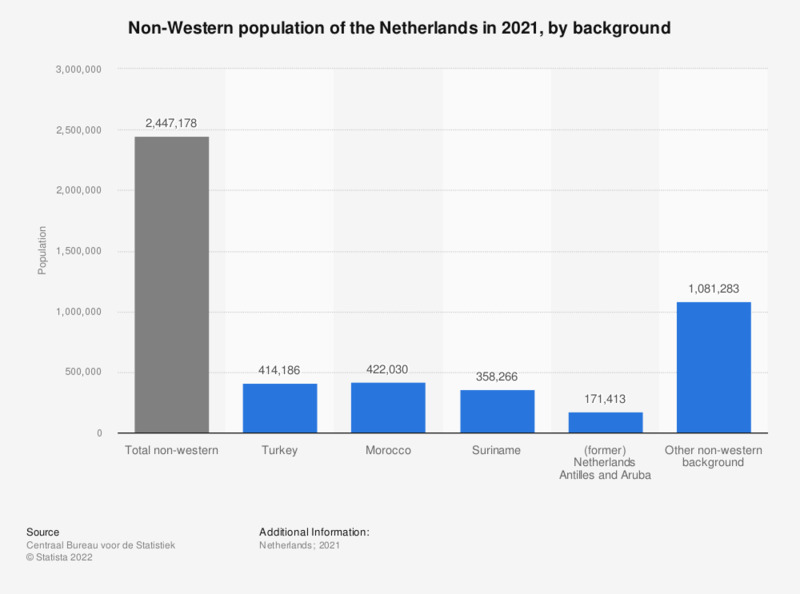 In 2060, it is predicted that there will be approximately 430,000 people with a Turkish background living in the Netherlands, and 470,000 people with a Moroccan background. By 2060 the population with a Moroccan background is expected to be larger than the population of Turkish descent. If this forecast is correct, by 2020 the population of Moroccan origin will be largest group of non-Western origin in the Netherlands. Persons with a non-Western background: someone who has at least one parent born abroad outside Europe (excluding Turkey), North America, Oceania, Indonesia or Japan. Because of their socioeconomic and cultural background people from Indonesia and Japan are also considered Western. All others are considered non-Western. President Emmanuel Macron acknowledged that France has not always done its part on refugees, but they will. Do you believe it will happen? Do you agree with Prime Minister Gentiloni declaring that those who welcome migrants cannot be left alone and that there is no unlimited capacity?